Terrance Altham doesn’t know why he’s been arrested. He’s committed no crime and the cops aren’t talking. Sadly, the man sharing his holding cell talks too much. Known only as Ghost, he is a young grifter, apparently familiar enough with this police station to convince Terrance a break out is possible, and pushy enough to leave Terrance no choice but to follow Ghost into the underbelly of New York City. Terrified by the unjust imprisonment and the possibility of a life behind bars, Terrance searches for proof of his innocence while Ghost seeks the elusive Butterfly King. But neither man seems in control of the weekend’s direction and the consequences of missteps are life-changing. As Ghost’s manipulations come to an explosive head, each man must decide amid danger and street violence what kind of man will triumph, lost or found? Narrator Vin Vanbly (a.k.a Ghost) returns in the most revealing King Weekend yet, where he faces the dark side of his dangerous manipulations, and learns mistakes can be deadly. 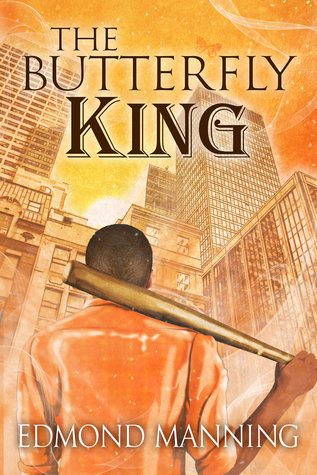 Vin must confront sinister dealings from his past—and a future promising disaster—as he waltzes Terrance across Manhattan in spring, searching for the elusive and charismatic, Butterfly King. I’ve read plenty of books that have made me sad. (One in particular earlier this year…well, I still feel its effects to this day.) But none of those stories ever made me cry. Maybe my eyes got watery…sure. I’ve been overcome with feeling, absolutely. But I’ve not once shed tears while reading, not ever. Until now, times two. And I’m kind of broken and joyous all at once for the experience. The Butterfly King touched me like no other; it’s a beautiful story about a man, Terrance, who is strong but lost, drowning in his fear. Fear related to so many things, from the color of his skin, to his city, to his occupation, to his family. He’s angry, he’s bitter, he’s fed-the-hell-up with the crap hand he’s been dealt. Enter Vin Vanbly, restorer of all things lost. Beware though, because this is Vin like you’ve never experienced him before: he’s younger, he’s greener and he’s less wise. He’s not as confident in himself or his abilities. Guess what, though? Those were the things that made this story so poignant for me. I wasn’t just a witness to Terrance’s deconstruction and rebirth, I saw Vin in this raw, weak, confused, more vulnerable state than ever before. The more you read about The Lost & Founds, the more you come to realize Vin is a man who needs control. He craves order and plans and schedules. He needs reassurance and feedback and approval and LOVE just like the rest of us. Funny thing is, the more you read about Vin, the more you realize just how hard those things are to come by in his world. Set in 1993, The Butterfly King takes place several years prior to the other Lost & Found novels. Terrance’s story is by far the most chaotic king weekend we readers have experienced yet. Things go wrong in major ways. It becomes clear in reading about Terrance’s kinging that there are larger forces at work. Others are running the show and operating the scene. You’ll never once wonder if Vin has things under control, though. Even as he doubts himself, you, the reader, will understand more than ever that Vin is OUR one true king. At times, The Butterfly King was amusing. At times, there was so much tension I could have sworn I was leaving fingernail-shaped grip marks on my Kindle. And the theme of colors, GAH, the colors! Orange and bronze and black and mahogany and gold (and more!) are so expertly woven and such a huge part of this story, in the most amazingly beautiful and subtle and metaphorical ways. I can’t say enough good things about The Lost & Founds series, about the indomitable Vin Vanbly, about the. man. himself, Edmond Manning. Without being too dramatic or fan-girly or gushy…just…read the words. Educate yourself about ALL these characters. You’ll have a fuller heart for the experience, I assure you. Butterflies, butterflies, come out tonight! Fan-Tastic. I loved this book; I love the whole series. Its so beautiful; the scene with the pennies brought me to tears. CanNOT wait for more! :-) King Daniel!!!! This entry was posted on November 4, 2014 by Jenni in Contemporary, Reviewer: Jenni and tagged 5 Stars, Edmond Manning, series.